First published on Transition Norwich’s Blog “This Low Carbon Life” on 7th September 2011. My family moved into our three-storey Georgian house in the country when I was four, and we all saw it as a great investment. What a wonderful place for the children to run around in, to play hide-and-seek and to keep out of each other’s way, and out of the trouble of a town street corner! We could create beautiful gardens, use the land productively and enjoy the serene country life! But naturally, at the time, energy was much cheaper than it is now, and energy efficiency wasn’t really a concern. Now that we have lived with it for over twenty years, we have seen the weak spots, suffered many a freezing night and put up with howling draughts. We’ve progressively added insulation and draught-proofing measures over time, but the house still gets cold. The thing is that the house is Grade II listed. This, in my opinion, is a good thing. It’s great that we have a way of protecting our heritage and respect the fine work of our forebears! The appearance of the house owes a lot to its oak-framed windows, and replacing them with UPVC double-glazed ones would look ugly and severely lessen our built heritage. However, listed building status does mean that even highly justifiable changes that some people can make “willy nilly” to their homes requires us to apply for special permissions. But we’ve found a solution to the window problem! No, didn’t think so. When looked at from afar, this looks just like the single-glazed, oak-framed, leaded casement window as might have been present when it was first built (although the ones actually installed are much newer!). But there were problems. The steel frames around the casements have a tendency not to fit well against the wooden frame, and leave gaps where draughts get through. And then there’s the “waterfall effect” as my dad calls it. This is where convective circulation of air in the room is caused by the waterfall of air being cooled by the window and flowing over the sill to the floor. To rectify these points, we firstly installed new seals. This reduced draughts and also helps to reduce “cold-bridging” (conductive heat transfer through solid elements) between the frame and the casements. We also installed secondary glazing. This is NOT double-glazing. Secondary glazing is simply another layer of glass (or in our case, polycarbonate), separateto the window, which is attached to the inside of the window frame. Because the glass is on the outside edge of the window frame, this leaves an approx. 45mm gap of air as an insulating layer. However, the main thing it does is eliminate the waterfall effect because the layer of polycarbonate is not much cooler than the indoor air, and a convective cycle is not generated within the room. Although we’ve only lived with these new measures during part of last winter, we’ve already felt the effect it has on the warmth of rooms and the reduction of draughts. I’m looking forward to seeing the effect it has over an entire winter season! 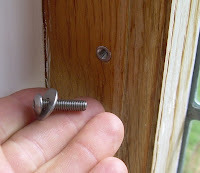 The polycarbonate is fixed using screws in oversized holes in the polycarbonate (to prevent concentrated stress in the polycarbonate and therefore cracking) with oversized washers to spread the load, into metal inserts (specially made) which have been installed into the window frames. Because the polycarbonate panels are screwed in place rather than glued or nailed, we can take them off easily for maintenance, opening of windows during summer and to show what the house may have been like more accurately in times gone by. If anyone wants to replicate the measure, or just to find out more about it, I’d be happy to answer any queries on our methods via the comments box below, or by email – simeon [at] simeonjackson.co.uk. Photos: The Georgian façade; Sitting room window; Corner of window with polycarbonate and a fixing point visible; Screw, washer and insert. Published on 7 September, 2011 at 9:54 pm by Simeon Jackson. Post a comment or leave a trackback: Trackback URL. Where could I get the “specialy made” metal inserts for the screws (which are not tapered?)? Sorry I’ve been a while responding. Very busy at the moment! The nearest I could find on the internet is the screw-in nut by Wurth http://www.wurth.co.uk/product/screwinnutsk. Perhaps that will do the job. Polycarbonate is 6mm, although you probably could get away with thinner for a window of that size, although you might end up with it not laying flat. I would suggest probably two fixings to each 1m edge and one to each 0.8m edge. Don’t fix at the corners, as this will tend to result in the plastic bowing due to the temperature differential – fix central top and bottom and about at thirds on the sides. Make sure that holes in the polycarbonate are oversized to reduce chance of stress cracking at connections. Good luck! As well as potentially being a cheaper option to double-glazing or replacing your sash windows altogether, secondary glazing could also slash the cost of your energy bills.